Professor Ann Cullinane gives horse owners information about Equine Influenza in a free webinar from the FEI Campus. Free online seminars about equine influenza for both horse owners and veterinarians are on offer by the FEI Campus. Both the videos are fronted by Professor Ann Cullinane, head of the virology unit at the Irish Equine Centre and chairman of the World Organisation for Animal Heath (OIE) Expert Surveillance Panel for equine influenza. They were produced by Cullinane and FEI Veterinary Advisor Dr Caterina Termine. In the seminar for owners, “Equine Influenza: a horse owner’s guide”, Cullinane explains what Equine Influenza (EI) is and the measures owners can take to protect their horses. The webinar is just over 17 minutes long. Topics under discussion include transmission routes, what to do in the event of an outbreak, current recommendations for vaccine choice and vaccination intervals; and factors affecting the horse’s susceptibility to flu to Equine Influenza. Cullinane is an Adjunct Professor in the University of Limerick, an Associate of the Faculty of Veterinary Medicine, UCD and serves as an equine infectious diseases expert on the OIE Ad hoc Group for the International Movement of Horses. The “Equine Influenza” webinar for veterinarians is 46 minutes long and focuses on the technical aspects of EI. 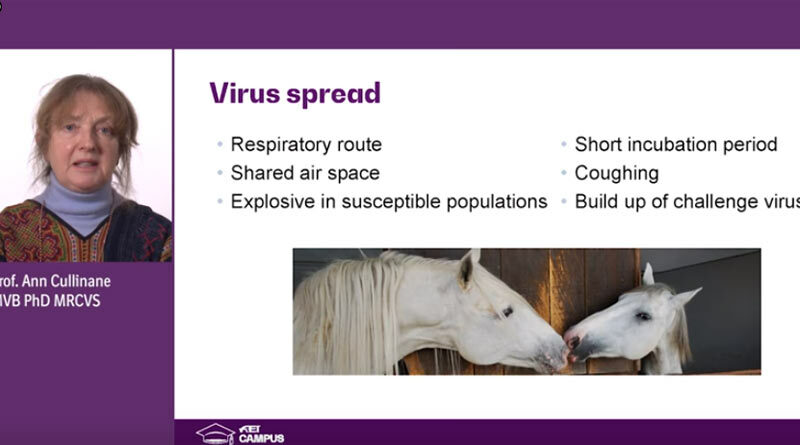 Cullinane explains the structure and epidemiology of equine influenza virus, its transmission, how to select the most appropriate vaccine and vaccine breakdown. Termine explains the FEI regulations concerning equine influenza vaccination requirements.